Hello from the Sunday morning of the Full Moon. Today, I'm sitting at home in my pyjama's, catching up on emails and online stuff, which at times, feels never ending. Online business can be a delicate balance. A couple of years ago, I found myself over exposed to and reactive towards, social media. Every time I opened the FB app, I felt assaulted by the pedestrian herd of opinion and mindlessness lack of information, imagination and often, both. So I deleted the app from my phone and installed a browser extension on my laptop, killing the newsfeed and... instant peace. It's important to have a sense of boundaries within oneself and online and to be intentional with the how and the what and the why I'm picking up that phone or laptop. As with everything, we are responsible for our own experience and wellbeing. These days, while it can be draining, I rarely resent social media. It is after all, the reason I'm doing what I'm doing, how I'm doing it and with whom! 'The Internets', has enabled me to pursue my passion, continue my learning and do business while finding connection and community. These things are hugely important to me and so I embrace my online presence as a facilitator of that. That online presence and social media, is also the reason why I had such a beautiful time, in the most healing company of Patricia Fitzgerald and Kamila Lukaszewicz this weekend. Patricia was in town to deliver her Mandala and Meditation Workshop in my studio yesterday and herself, Kamila and Patricia's daughter all travelled up & stayed with me on Friday night. I can't believe we were only 24 hours in on another's company, such was the value of it. Kamila, is an Alchemist and Sound Healer at Alchemy Holistic Therapies, in Maynooth. She arrived with her singing bowls and Sansula. I cooked us dinner, after which we made tea and took a stroll down the end of our road to the cliffs edge, where we sat on the rocky shore of the Wild Atlantic as Kamila, with her bowl, her voice and her radiant spirit, created sounds which coupled with the ocean waves, imprinted in me such serenity, my insides are still reverberating from the effect. You can see a little of the experience here, but of course, it will no do it no justice. I'm close to tears even writing my memory of it. It was so special and reminded me how I used to love my sound baths. I will be travelling down to Kamila for Sound Healing sessions, for sure. And if that wasn't enough, we then returned home to a roaring fire & got in our jammies. 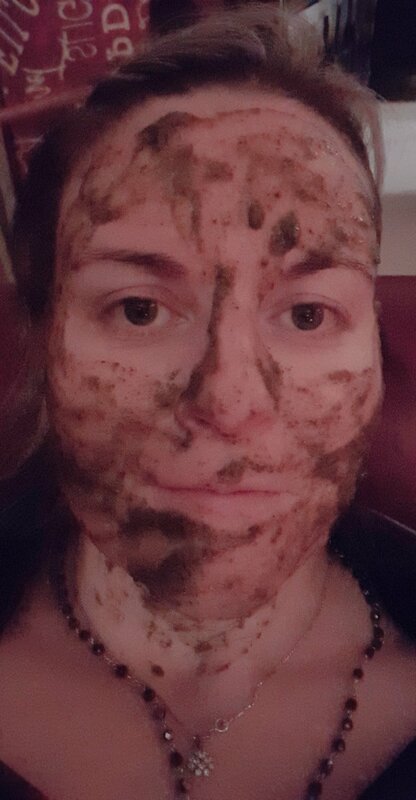 Kamila whipped out some homemade herbal face masks, I whipped out my oils and we gave and received facials and foot massages, while Patricia's daughter Rebecca, explored the sound instruments and showed herself to be a natural with them. Healer friends, are the best friends. The next day, Patricia unleashed her magic on us and after introductions and such, shared with us her insight on Mandala's and sacred Geometry and the power of intention and vibration and before my pencil even hit the paper, I was emotionally charged in appreciation and wonder for the power of mandala to serve as a yantra, or visual mantra. 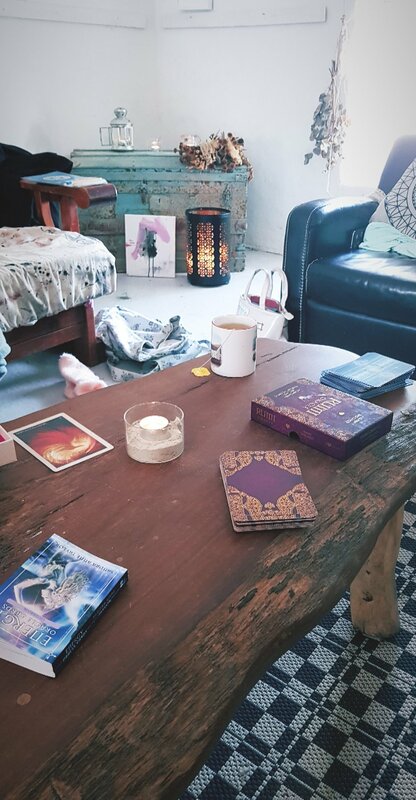 I set my intention that my mandala, was going to represent for me, as do my journals, recovery as a sacred space and the container in which, I hold and nurture myself and to which I am devoted. As always, the act of creation served as a metaphor for so much else in my life. How I'm a deep diver. How I'm fearless in the abyss. The degree to which I am a student of my own process, a pilgrim finding my own way, even if most times, that way will inevitably lead me down the path of overwhelm and tangled up in complexity, because I resist the simplicity and order, I simultaneously crave. During our closing guided visualisation, something surprising presented itself to me. My mandala carried with it, the suggestion that I be more mindful with my words and of using my voice in ways that no longer serve me. It's been on my mind a while now to say goodbye to a certain part of me, I feel I have outgrown. She's the part, who uses words to cut, not only others, but myself as well. I wasn't expecting for that to come up yesterday, but it did and as I reflect on that, I see that this message was really brought to me by the healing women who stayed with me and helped me remember, how powerful vibration is and that I too, am in possession of that power and it is time for me to respect it. I feel immensely grateful for and uplifted by the experience.